Ladies and Gentlemen, please welcome to the blog (with an awesome series of tips), our good friend Mr. Rob Sylvan! Greetings! A huge thanks to Scott for reviving this series for new Lightroom users, and to both Scott and RC for giving me the opportunity to add 10 more tips. You can catch up with Scott’s earlier tips if you missed them. The original idea for this series derived from my experience as the Lightroom Help Desk for KelbyOne, which I’ve been doing since Lightroom 1.0 was released. The Lightroom and Photoshop Help Desk for is a feature of a KelbyOne membership, and I’ve been happily helping members get the most out of Lightroom for a long time now. Despite how far Lightroom has come there are still some common pain points I see people struggle with week after week, so it was my hope to share these tips to help future new users avoid these same problems. While directed at new users, I’ve certainly met my share of experienced users who stumbled on these things the hard way, so here’s hoping you find something that helps you no matter what level you’re at! If you read no other Lightroom tip, then I hope it is this one. I can’t tell you how many stories of wasted time and pulled hair have resulted from the default setting for this Lightroom preference. So please follow along and it may save you from going down that painful road too. Head over to (Mac) Lightroom > Preferences > General / (Win) Edit > Preferences > General to see what setting I am talking about. The pre-loaded default catalog setting. By default this has been set to Load most recent catalog since the beginning of time. My understanding is that it is based on the rationale that users only have one catalog, and so it is always the last one being used, so just open it each time Lightroom is launched. Sounds harmless enough. 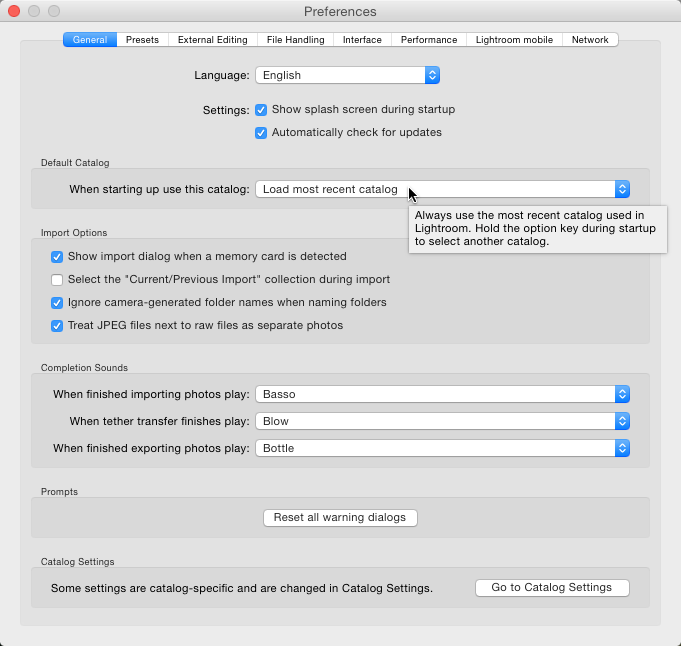 The problem for new users is that this setting works fine in the beginning, but there seems to come a point when they open some other catalog, most commonly an old backup copy that looks identical to their current catalog, and then with curiosity satisfied they quit Lightroom. Guess what happens the next time they launch Lightroom? Yep, that old backup copy (or whatever catalog it was) gets opened instead, and too often the user is none the wiser. Heck, one Lightroom catalog can look exactly like any other catalog if you are not paying close attention. Now the unsuspecting user is happily working in this other catalog until some future date when they can’t find something they knew was there before, and then whammo, chaos and confusion hits as they try to sort out what went wrong. The worst case scenario is when a user had opened and closed an old backup copy of the catalog, which they unwittingly continue using until they get around to deleting their old backup copies of the catalog and whoosh … there goes all of their recent work. Man, that’s always one of the most painful scenarios to have to explain to someone who just lost hours, days, or more of work. Take heart though, it is so easy to avoid. Here’s how: change the default catalog setting to anything other than Load most recent. That’s all there is too it. For most people the right choice is to simply select their actual working catalog as the default. When you click that drop-down menu you’ll see your current catalog listed, so just select it. Customize the default catalog setting. The other option, Prompt me when starting Lightroom, is most useful for anyone with more than one catalog, but if you saw Scott’s earlier post it makes the most sense for new users to stick to one catalog. That said, what I like about the prompt setting is that it makes you choose your catalog each time, which helps put you in the driver’s seat for this important decision each time. Here’s hoping you just dodged that bullet. I do give Adobe credit for making a change in Lightroom CC/6’s catalog backup function, which now compresses each backup copy into a zip file. This results in a substantial savings in disk space and it makes it a little harder for an unsuspecting user to open an old backup catalog unless they really want to do it. More on that in the next tip! As this series rolls out you can find all of my 10 More Things posts. Very good information, I didn’t even thought about that. Thanks For Sharing Admin this very usefull for me thanks for sharing.. I am using Lightroom 5.7. My Catalogue weighs 37.5 MB. Similar to Jack’s my catalogue is not zipped. 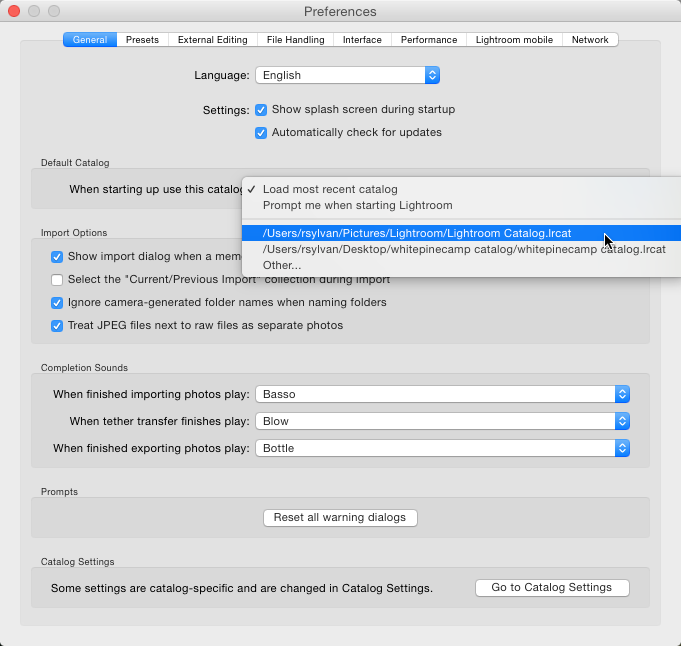 The automatic zipping is a new feature of Lightroom 6/CC. For previous versions of Lightroom you can compress it manually, or use a Lightroom plugin called “LR Backup” found on a website called Photographer’s Toolbox. That would explain the behavior of LR 5.7 🙂 Thanks a lot for the quick answer and the hint on LR Backup. In addition, store the Lightroom catelogue in a Dropbox folder and your catelogue will always be safe. This can work well for some, but I wouldn’t suggest it for everyone. Not everyone has enough dropbox space, and not everyone has fast enough bandwidth to sync the catalog and preview cache after a given session before shutting down. What I do instead is to direct Lightroom to create the zipped backup copies in my Dropbox folder, so those are synced to the cloud and my other computer. The zip files are much smaller, and since I don’t open the catalogs at that location there are no preview cache files created there. I’m using LR6. My backups still show up as lrcat files. How do you get the backups to store as a zip file? Thanks. Jack, It’s automatic. Nothing more to do. I’m guessing you are seeing .lrcat in the file name still, but are you sure it is not actually compressed into a zip? Mine is definitely a lrcat file. Same thumbnail as my old lrcat files and when I doubleclick it, it launches LR, does not unzip. Is your catalog very large? Like larger than 4GB? It looks like the default unzipper on Mac can’t handle unzipping files that large, so Lightroom doesn’t compress the backup in that case. That would be it. My catalog, 233,000 raw files, is about 6.3 gb. Thank you for the assistance! With LR 6/CC the compressing of the backup copy into a zip file is automatic. When you install the Dropbox desktop application it creates an actual folder (named Dropbox) on your local drive, so you just direct Lightroom to save the backup copies to a folder inside that Dropbox folder and everything is automatic from there.